After work I stopped at the Studio, to pick up some school stuff and maybe do a little work on the tower block. The problem with the latter was that I was missing the value breakdown I did on Saturday. (thought I had it with me, not the case) And the Bosch book I brought didn't have all his characters that I had put inside the prison. I cut the two who were in the book I had at hand, and decided to play around with one section of wall that I knew for sure was mid-tone shadows, the far left edge. Piranesi's originals are full of cross hatched lines to build values, and I could do something like that, but it would not fit well with the cutting style of the rest of the block. I tried the next best thing, a slightly rougher cutting of the shadowed blocks (did something like this with the Employee print to differentiate rough concrete blocks from finished cement), as if light was passing obliquely over the rough stone. 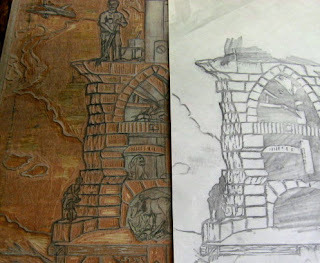 I did a rubbing of this section, which you see side by side with block. 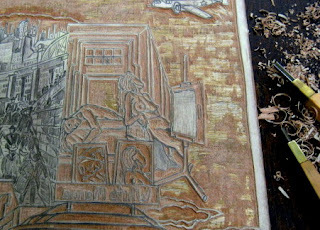 Rubbings aren't exact, tend to pick up some stuff that the inked brayer won't, but it gives me a general idea where this is going. I will use color choices to carry most of the light/shadow idea, but the cutting style should reinforce the 3D effect, as well as give it a little of the feel of the original. Next time in the Studio I'll try to finish the rest of the prison and its occupants. While at the Boatworks today I dropped off a piece of artwork for the 2nd BAC Members' Salon. This will be a brief exhibition on display inside during the Mural Dedication ceremonies, and will remain up at least through the December 6 monthly meeting. That meeting will deal with the usual business, but it will also be one of our Salon events, at which members choose a work to display and will have the opportunity to talk about it with whoever is there. I brought a couple of things, but after some discussion, decided to put this one in the show. I won't be there on the evening of the Salon, so I'll put the story here for anyone who wants to know. The print is called Trance, one of the first woodcuts I did after finishing my MFA and moving back to NJ. This print gets its title from the trance films of Maya Deren, which I was exposed to in an experimental film class at SIU. Deren wrote, directed, and starred in the silent films, which featured odd symbolism, simultaneous multiple versions of her character interacting, and sudden odd dream-like transitions from one location to another. I wanted to capture this approach in a single carved image. My solution was to overlap the various points in the narrative (rather than a series of separate panels like in a comic strip), letting one scene melt into the next. The plot was borrowed from an actual dream I had about 10 years earlier- people in a church eating roses covered with butter and honey. In the print I adapted it a little, the roses growing near a church (Sacred Heart Cathedral Basilica in Newark), but having the character bring one home to prepare and eat, before going out to get another. Got a friend who was not put off by unusual ideas to pose for 8 charcoal figure drawings (the vintage looking fridge, typical of my work, was actually in her apartment) which I adapted for the print composition. In general I was pleased with the results, though it would be several years before I would attempt another compostion of such complexity. We had a fairly nice day today, so Pat and I met up at the Boatworks, joined for a while by Beth, one of our professional consultants. 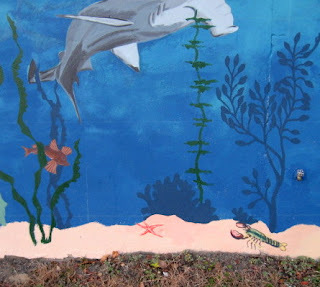 I did some plant touch-up and put in two new sea creatures shown in the 2nd photo- the lobster on the river bottom and a sea robin in the weeds. 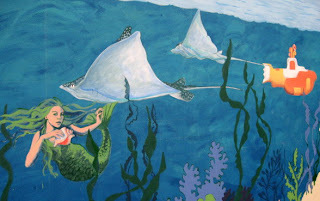 Beth added two large rays (3rd photo) and some detailing to the large seahorse (4th photo). 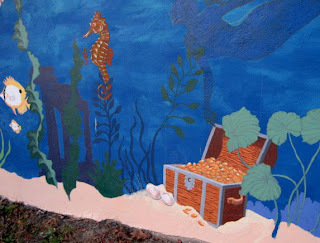 The last photo also features the treasure chest that Pat brought from rough blocking to full detail. Click on the top photo to see the whole thing. Pat said she may try to do some further detail work (weather permitting) over the next few days, but otherwise this is pretty much what will be done for next week's dedication ceremony. 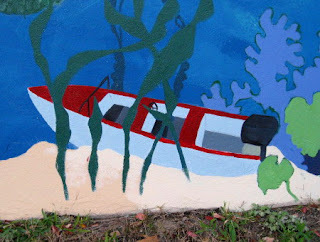 Of course, anyone can come see it anytime there's daylight, but if you want to see Bob Mataranglo's video documenting the making of the mural, and enjoy music and refreshments, come by the Boatworks on Sunday, December 2, 1 to 3 pm. There will also be an art show inside with work from members of the Belmar Arts Council. For more information, see the BAC website. Back into the Studio on another chilly day. I arrived in the early afternoon and found Molly hard at work on a new block, a commissioned piece. Before I could do any cutting of my own, I had to resolve the light and shadow issues of that prison. 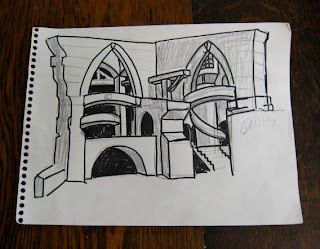 I sketched the basic architecture on a piece of paper, and used a marker to show the main lines. After looking at Piranesi's original prints, I settled on a light source, and noted which would be the lightest areas (left white). The darkest areas that will remain black on the block are blacked in with the marker accordingly, and the midtones are filled in with pencil. With that settled, I made some basic notations on the block drawing and began cutting. After a few hours Molly and I took a break to get some beer and pizza across the street to bring back in. 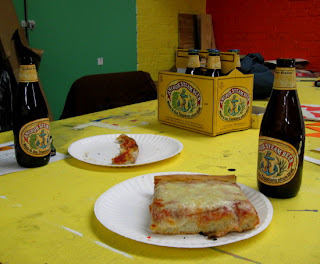 (Molly has owed me a few drinks going back a while, and we were both a little hungry) That's my Sicilian slice in the foreground, with the remnants of Molly's slice (mostly consumed on the walk back to the Studio) and the beer debt paid. We discussed various Studio issues and plans while we split the 6 pack. I let the alcohol wear off a little before going back to work. I pretty much finished all the light areas today, stopping when the holiday festivities got rolling upstairs. Next time I'll deal with the medium shadows and the various figures within. It was pretty sunny today, but never got to 40 degrees, so outdoor mural painting was postponed in favor of working in the Studio. I moved to the left of the models to cut the Masereel inspired city. People who have seen the block assumed this would be a particularly difficult section to cut, but I knew from experience that the drawing was the tough part. The whole thing took less than 2 hours. 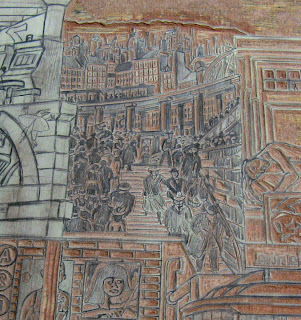 I took a rubbing afterward, found that the buildings looked pretty much like his original print, but the figures were not quite as clear and distinct. I put a few more cuts into the block to outline some of the more prominent figures (which is what Masereel did himself), and a second rubbing looked better. The remaining pieces of the tower still require further resolving. I made a quick sketch of the prison section to take home and consider. The big issue is deciding the light and shadow. It's not always clear in Piranesi's originals where the light sources are coming from, and my prison is only partly based on one of his. I'll try to figure it out over the next day or so, because it may affect how I decide to cut this section. 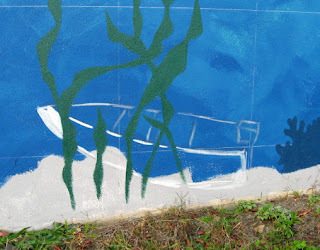 We took advantage of the warm nice weather today to make significant progress on the mural. When I arrived Pat and Merry were already there. I started with the item in the top photo, the sunken boat. The shapes didn't change much, just the colors, dulled and darkened a little to help it sit back in the water. Added the details of windshield and steering wheel. I think it's done. 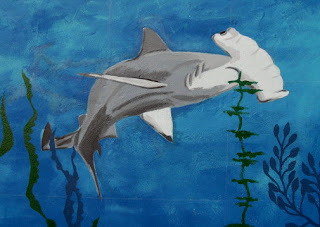 I spent the largest part of my time today working on a hammerhead shark, one of the suggested items from the community mural day. Pat pulled up an image off the web as a guide. It showed a profile of the shark swimming straight, but a more dynamic pose was requested, so the front half is pretty much like the photo, but I changed everything behind the dorsal fin to imply more movement. 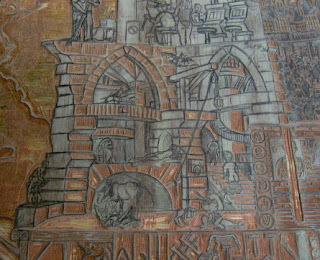 With a little daylight remaining, I put in one more item from the community mural- the lost city of Atlantis. (how do we know it's not in Shark River?) We wanted it to be something in the distant background, so I put in a silhouette in a dark color (3rd photo) in the shape of a classical Roman/Greek style ruin. 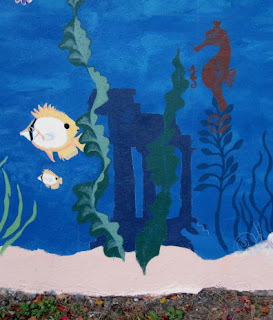 The color may change later, as we see how it reacts with other things in the mural, but this will do for now. The other painters were busy, too. 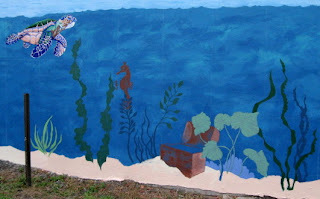 Another mermaid (in silhouette) was added, along with more plants, a variety of sea floor animals, and some swimming fish. All of these can be seen by clicking on the photo of the whole wall. There are still many things to be added, so we're hoping for some more warm dry weather between now and the dedication on December 2. I put in some hours after work at the Studio. First task was to finish the subway signs on the column next to the gallery. My first time riding the subway in NYC was on my first visit to SoHo- my friends and I were dropped off by car, but needed to use public transportation to get home. Subways had once had a reputation as particularly dangerous, especially back in the early 80's, but even at the height of crime in the city millions rode without incident. Since I hate driving in the city, to get around I either walk or take subways, and if I need to cover a lot of ground or need to go quickly, that means a train. For this print I chose 6 random trains, all of which I have used at one time or another to get to and from art- A 2 N 6 L V.
More time was spent on the figure drawing/studio area up on the top level. (normally I would have finished the 5th level first, but I still have much to resolve in the prison section, so I put that off for now). You can find the whole story of my experience with figure drawing in this earlier entry. I left one area uncut tonight, the blank page on the easel. I may leave it blank, or I may put another drawing on it, but if so I have to decide what it would be. 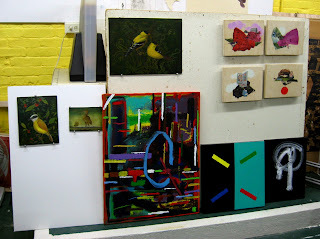 It was too cold to work on the mural today, so I went into the Studio to work on my tower block instead. First I finished off the White Manna restaurant, which was just the sign and the front panels. Then I worked left to the gallery space. Did the standing pipe and column first, then the wood floor, the brick wall, and finally the artwork. For those newer readers of this blog, you can find the story behind the White Manna and gallery here, and the story behind the artwork here. 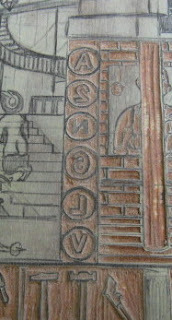 I carved the square column with the subway signs, but left the signs themselves for the next visit. Working on the mural project doesn't always mean painting. 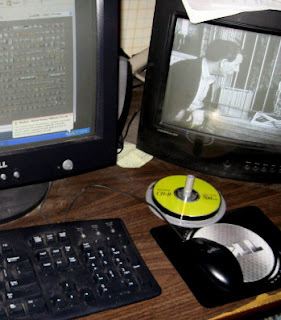 Today it was computer work. 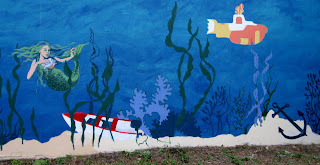 There is a plan to produce a video about our mural project and show it at the dedication ceremony in December, and anywhere else someone wants to see it. The person who is going to put the video together is Bob Mataranglo. 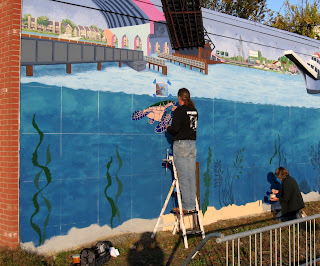 Our professional muralist is even better known in some circles for his digital video productions. 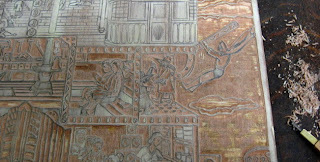 A good bit of the video will include still photos of the the mural from beginning to end, and that's where I come in. The photos I've been taking to post to the blog are the most complete record of the process, starting with a blank wall and up to what we did yesterday. When we were both painting in Belmar on the weekend I told him I could get him a disc this week, so I spent some time this morning burning more than 160 jpgs to a disc, a mix of raw images from the camera and edited images. I often see him at the school (where he also teaches) cafeteria on Thursdays, but he wasn't there tonight. No problem- I know where his classroom is, and was able to hand it off to him. He has his own photos, and may shoot some moving images as part of it, but it will have to be soon- that dedication is in about 2 weeks. Took care of something for my brother up in Hazlet today, but it finished up by early afternoon, and I had time to join the mural painting this afternoon. It had gotten cloudy, but was unseasonably warm, so better than the last time I painted. Pat was already there, and she and others had done quite a bit over the past two days, as the photos show. I continued with my sunken boat today, refining the overall shape and putting down some color. None of what you see is the final state- at the very least the colors need to be dulled down a bit so it sits back in space, plus some of the lines can be improved and some details are still missing. But at least its place is all set, and I can deal with that the next time I have the right combination of decent weather and free time. After I left Belmar, I made my way to the Studio. A busy place today. Molly had hosted a group of students from Asbury Park for a printmaking field trip earlier in the day, and their teacher came back while I was there to pick up the results of their silkscreening. Meanwhile, one of Molly's workshop students from LBI was in for a promised studio session. And Molly was getting ready to meet with a third person that she's doing a commissioned piece for. In the middle of all this I decided to get a little cutting done on my tower block. Next in line is the White Manna diner on the 5th level. I got the roof, door, and some of the exterior walls finished, but had to head to my next stop, so the rest will have to wait until the next time. Got the word that I'd be painting solo today. While the air temperature may have been a degree or two warmer than yesterday, the sun was completely behind the clouds, and that made a lot of difference. Paint took a lot longer to dry, and I cut out some of what I hoped to accomplish as the chilly damp air took its effect. I did make some progress. I mixed up a light green from more of our Sipersteins supply (mostly some of the blue mix used for the the water, along with some Creased Khaki yellow and Poinsettia red) and used it to fill in a large broad leafed sea plant that Pat had pencilled in yesterday. Results shown in the top photo. Before leaving I also sketched in the area where the sunken boat will go. I had neglected to bring my original paper version with me, so I used a tiny image off my camera's display monitor (from Community Mural Day) as a basic guide and sketched it with pencil. I was going to leave it at that, but worried about whether it would survive the expected rain, so grabbed some white paint and put down a few minimal lines. This contour still needs work, but at least it holds the place until my next time painting. It's been quite a while, four weeks exactly, since the last time I touched brush to wall on the mural project, but today was finally time to continue. Pat had come up with a basic sketch plan and had put up a grid on the wall, and the weather seemed just warm enough to get paint to stick to the concrete. I met up with her and special guest muralist Bob Mataranglo in the early afternoon. 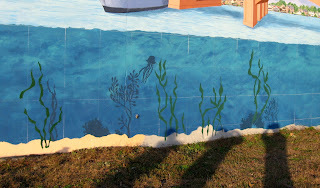 Bob was here to work on his contribution to the undersea portion of the mural, a giant sea turtle. Pat and I started putting in sea plants. I mixed up a greenish color from a selection of Siperstein colors- Windy Pine, Grand Grape, and Harbor Blue. In the top photo you see where I filled in (the lighter green) Pat's earlier pencils. The ones in the bottom photo (right side of the mural) I painted freehand based on Pat's gridded paper sketch. Meanwhile she mixed up a bluish tone for some plants and other sea life, and started putting in some sand at the lowest level. Things were going well until the temperature seemed to drop 10 degrees in a few minutes, which was a sign is was time to go. But we plan to return tomorrow and see how much we can do with another expected warm day. 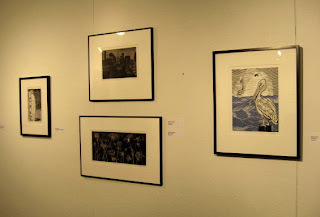 Today was the opening reception for the 33rd Annual Members Exhibition at the Printmaking Council. I got there just after 1 pm, and the place was pretty empty, but that changed quickly, with more than 50 people coming through at one point or another. I got some good news right away- gallery coordinator Matt told me that I was one of 3 artists chosen for an Award of Excellence by show juror Lisa Panzera. This means that I will get to be part of a special 3 person show next year in the Library Gallery in our headquarters. My prize winning prints are shown installed in the top photo. (for a better look at the prints themselves, go to this earlier entry) As usual, it's a pretty good show- our members have some impressive skills. 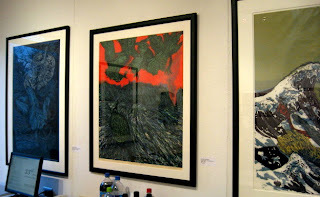 The last photo shows some work from Donald Axleroad, one of the 3 artists sharing the Library Gallery this year. 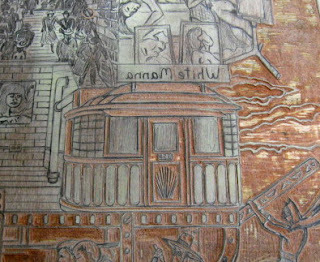 More of his cool woodcuts can be seen on his website. If you want to see all this for yourself, get yourself to North Branch before January 26. I also learned from Matt that the Process Exposed show that I helped curate is currently on display through December 14 in its third location- the Center for the Visual Arts Gallery at Brookdale Community College in Lincroft, NJ. 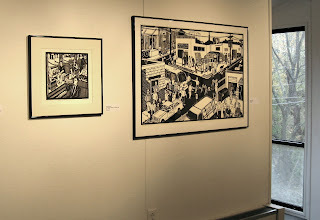 For a reminder of what that show looked like at PCNJ, check out this June posting. You will find details, directions, and contact information for the current showing at Brookdale on this page. Don't miss your last chance to see this very interesting and educational show. Tonight in our Studio we had the second meeting of the open critique sessions that Molly started. Some issues with the advertising this time, so a slightly smaller group than last time, but still it was fun. The top photo shows some of the art put on display for the first round of discussion. As you can see, a very diverse group of artists. Not really any printmaking in this batch, but I'll make an exception and show it here. 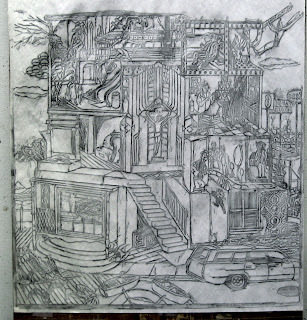 I decided that I would show a rubbing made from my current tower block as my contribution tonight. At the last meeting, all that had been cut was the negative space and a little below the tower. A lot more is done now, and I figured the rubbing might be easier for the group to read at a distance. So while Molly was preparing for the people to arrive, I got my pencil and some newsprint and did this. It's pretty much what I expected, but it's still nice to see. And it seemed to go over well with the others. These critique sessions are open to any interested artists, in our space in the Jersey Shore Arts Center, on the first Wednesday of every month. The next one will be December 5, at 7 pm. Just a short visit to the Studio tonight, but it was enough to finish off the erector set parts of the tower structure. Somewhat tedious, but I worked through it in a little over an hour. This finishes the 4th level. Next time, I move directly upward to the White Manna. After a little longer away from things than usual, I was back in the Studio for a while today, continuing on the 4th level of the tower. First I did the detail from Homer's painting, then the assorted comic book characters. I decided to end it there today, and deal with all the erector set parts that surround these various figures on my next visit.